Karmic Fury Records is proud to support the awesome cause behind RecoveryRockFest! When do you get to see amazing music outside of the bar scene or surrounded by alcohol? Local music producer Nyla Cione is bringing this brand new concert style to Wilmington while at the same time supporting the recovery community and donating to a good cause. RecoveryRockFest features national headliner Melissa Ferrick and local favorites Folkstar, Stray Local, and Mike Blair and the Stonewalls. 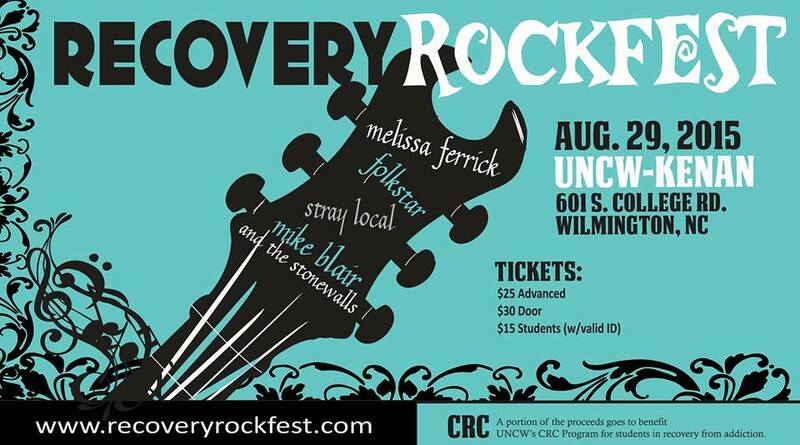 RecoveryRockFest is a clean & sober rock/folk concert supporting people in recovery from addiction featuring original local and national artists Melissa Ferrick, Folkstar, Stray Local, and Mike Blair and the Stonewalls. A portion of the proceeds goes to support UNCW’s CRC Collegiate Recovery Program. Karmic Fury Records recording artist Folkstar is proud to be a part of this event! It is known that 1 in 7 people from age 12 and older will have an issue with addiction and it is estimated that 40 million people are affected as a whole. RecoveryRockFest wishes to provide a substance free folk/rock concert in celebration of recovery and for those who desire a substance-free lifestyle. A portion of funds will go to support our local university UNCW-CRC Recovery Program* for students in recovery which offers resources for UNCW students in recovery from alcohol and drug addiction, gambling addiction, and those affected by other people’s addictions. RecoveryRockFest (originally named Recovery Rocks) first started in 2009 in a small cafe in Bradenton, FL. It allowed people in recovery and their friends to enjoy a substance free concert in celebration of recovery, and to meet others in the community. RecoveryRockFest has moved to Wilmington, NC and we look forward to having this event here in our new recovery community. Addiction affects many families, friends, loved ones, and has also affected myself and my family. It is important to me to give back and to be a part of something that can carry a message of hope of recovery. To come together in one place through the language of music, and to share and show that recovery is worth it, and that we are not alone. Many people still struggle with addiction and I know for myself that when I met other people in recovery, I didn’t feel so alone. I personally have been in long term recovery for just over 23 years. It has allowed me to also be of further service to my community. It is something I get to do, and I am grateful to be able be a part of a positive message. I personally welcome you to join us on our first year in Wilmington for RecoveryRockFest!